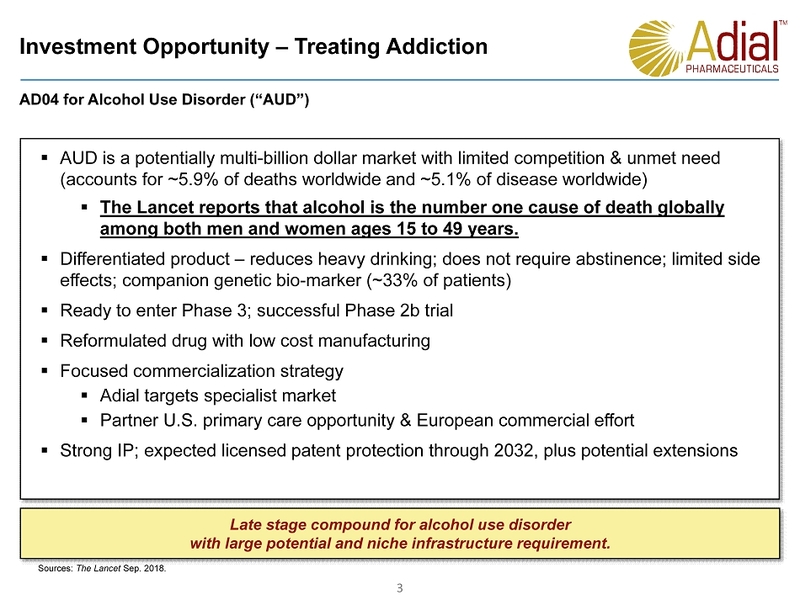 3 Investment Opportunity – Treating Addiction AD04 for Alcohol Use Disorder (“AUD”) Late stage compound for alcohol use disorder with large potential and niche infrastructure requirement. 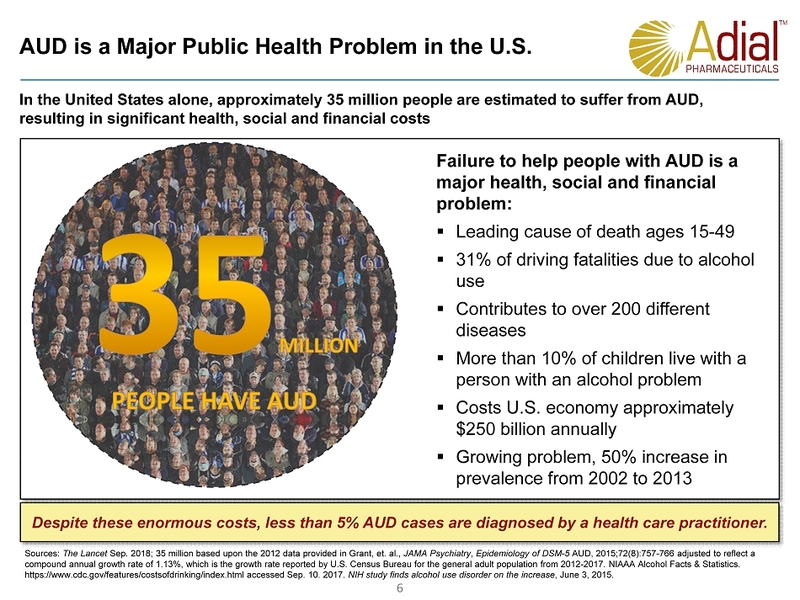 ▪ AUD is a potentially multi - billion dollar market with limited competition & unmet need (accounts for ~5.9% of deaths worldwide and ~5.1% of disease worldwide) ▪ The Lancet reports that alcohol is the number one cause of death globally among both men and women ages 15 to 49 years. 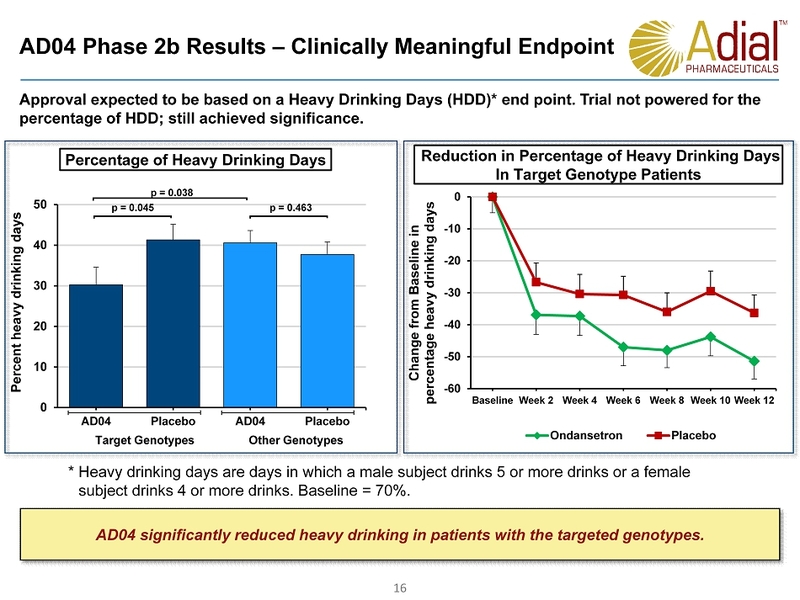 ▪ Differentiated product – reduces heavy drinking; does not require abstinence; limited side effects; companion genetic bio - marker (~33% of patients) ▪ Ready to enter Phase 3; successful Phase 2b trial ▪ Reformulated drug with low cost manufacturing ▪ Focused commercialization strategy ▪ Adial targets specialist market ▪ Partner U.S. primary care opportunity & European commercial effort ▪ Strong IP; expected licensed patent protection through 2032, plus potential extensions Sources: The Lancet Sep. 2018. 4 William B. Stilley, MBA, CEO. 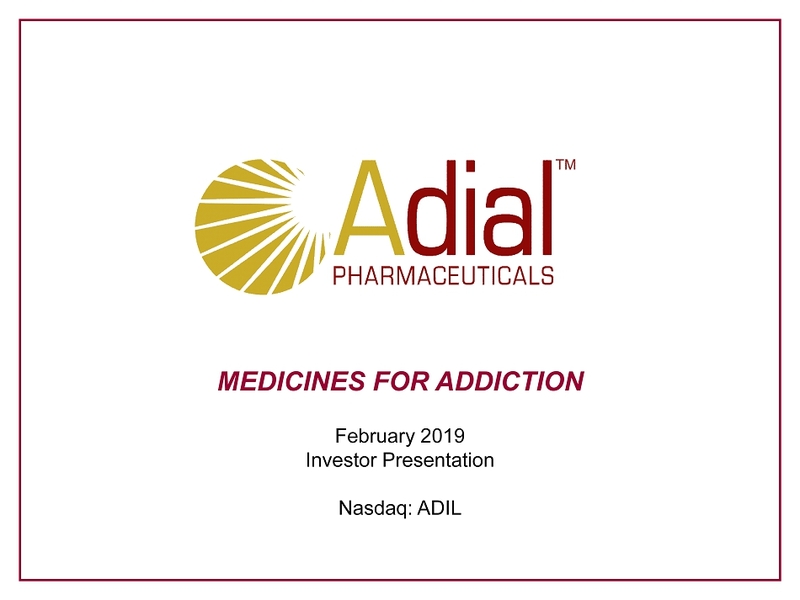 Successful deals and financings (e.g., J&J, Novartis, Santen Pharmaceuticals, Novartis Ventures, ATEL Ventures). 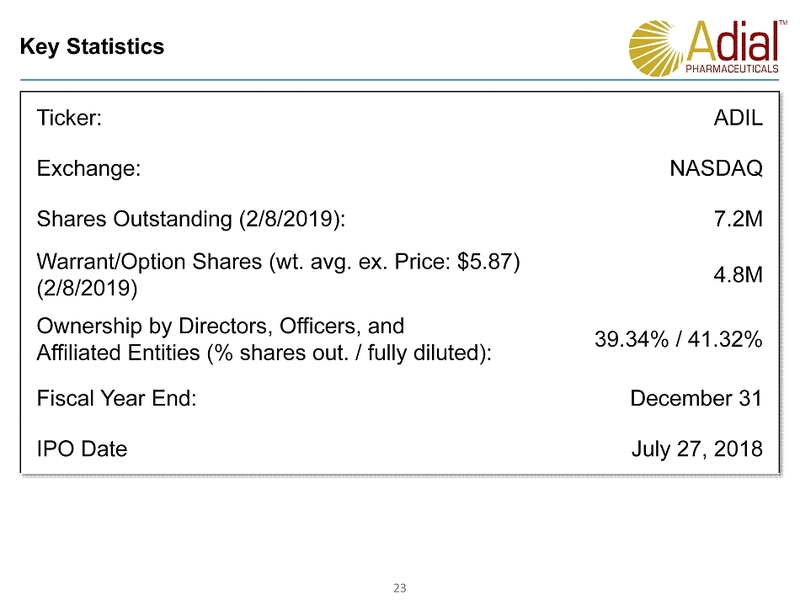 Previously, VP Bus Dev & Strategic Projects at Clinical Data (NASDAQ: CLDA) where he transacted licensing/M&A, managed Phase 3 development, and drug manufacturing for Viibryd ® for commercial launch; COO & CFO Adenosine Therapeutics, where he led research, operations, and finance. 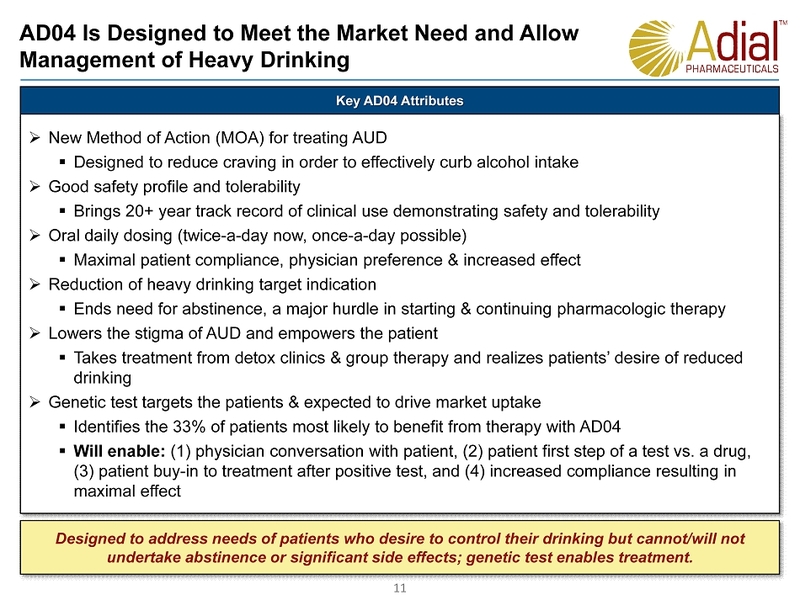 Inventor of Stedivaze ® , a drug Phase 3 development. Captain, U.S. Marine Corps. 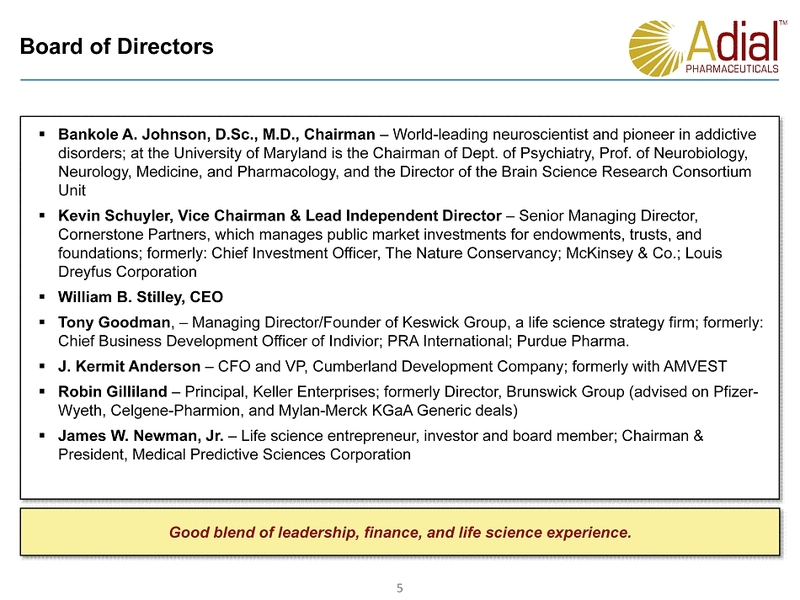 Current Board member, Avalon GloboCare Corp. and Virginia BIO. MBA from Darden School of Business. Joseph Truluck MBA, COO/CFO. 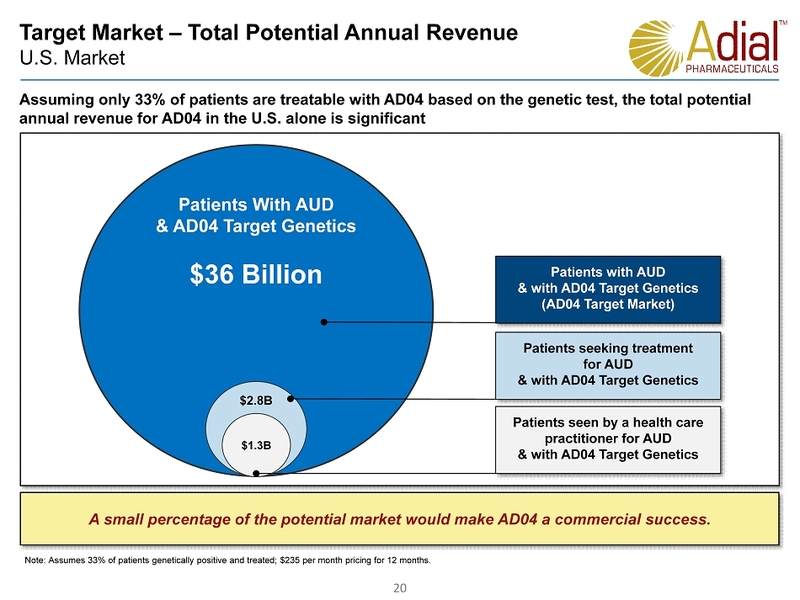 Previously, VP, Ops & Finance at Adenosine Therapeutics; Clinical Data (NASDAQ: CLDA); Beonten . MBA from Tulane. Worked with the CEO >10 years. Tomasz H. Zastawny, D.Sc., Ph.D., CDO. 25 years of pharmaceutical products development experience. 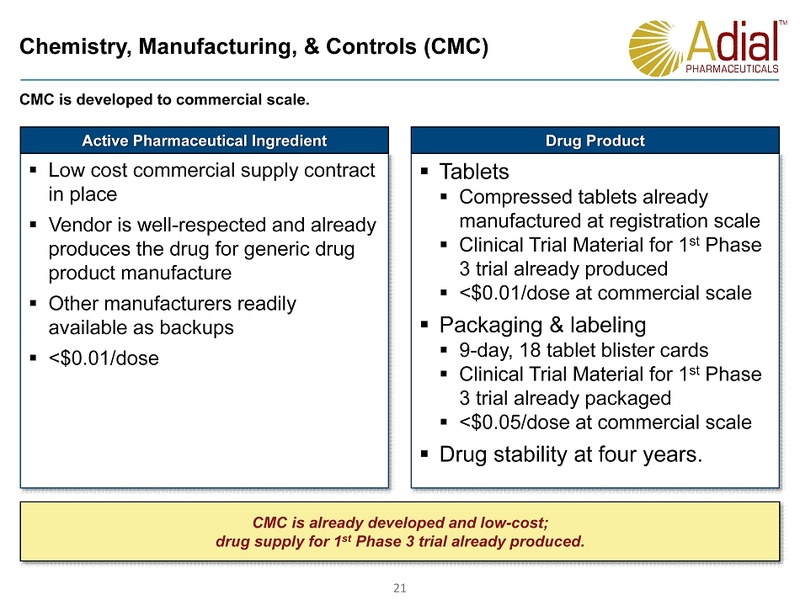 CEO of ECRC, a pharmaceutical products and medical devices development advisory firm. 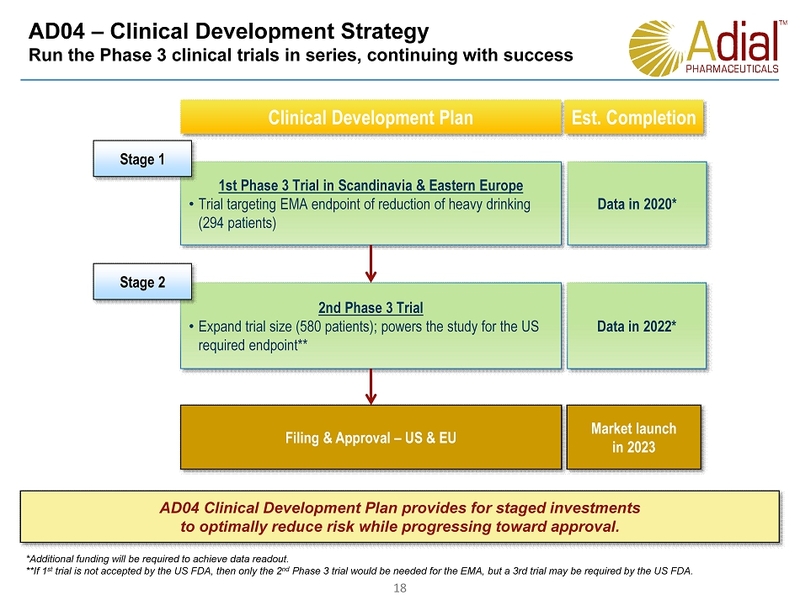 Leadership role in planning and execution of >150 clinical trials in U.S. and internationally. Previously, VP of Drug Dev & Clinical Ops at Aveo Pharmaceuticals, VP of Drug Dev at Amrita Therapeutics, VP of R&D at Boston Therapeutics. 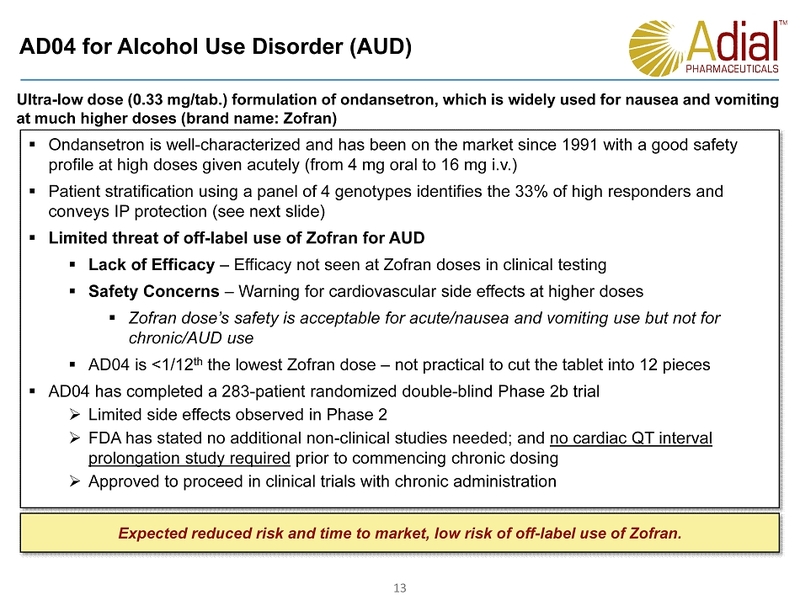 Leadership role in approval of FOTIVDA ® (tivozanib). D.Sc. and Ph.D. Monika Z. Rogozinska, SVP Drug & Business Development. Previously, VP and Head of Portfolio, Program & Project Management at ECRC in Boston; Senior Director and Global Program Leader at EMD Serono, an affiliate of Merck KGaA , where she led the clinical development, regulatory submissions and lifecycle management of various drugs under clinical development, including Bavencio ® ( avelumab ), and where she developed with Pfizer the global development strategies and operational plans leading to a total of 30 clinical programs and nine pivotal studies. 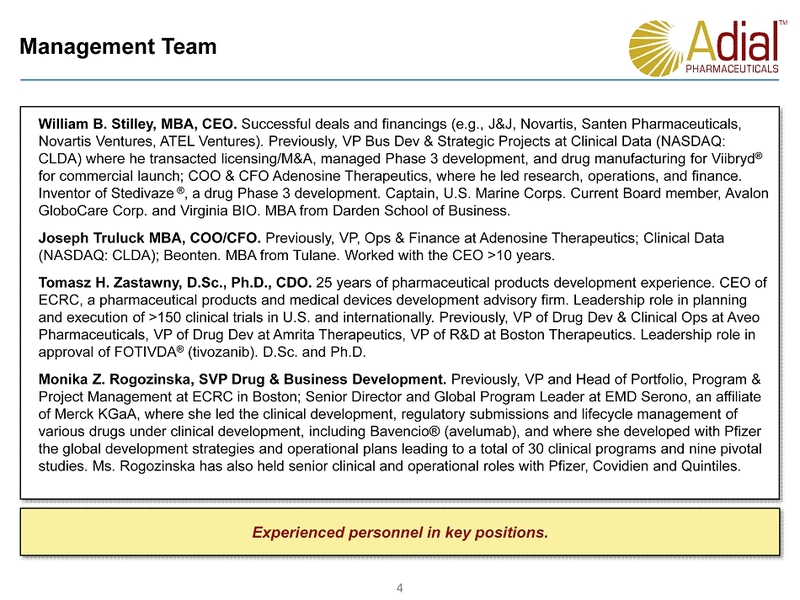 Ms. Rogozinska has also held senior clinical and operational roles with Pfizer, Covidien and Quintiles. Management Team Experienced personnel in key positions. 5 ▪ Bankole A. Johnson, D.Sc., M.D., Chairman – World - leading neuroscientist and pioneer in addictive disorders; at the University of Maryland is the Chairman of Dept. 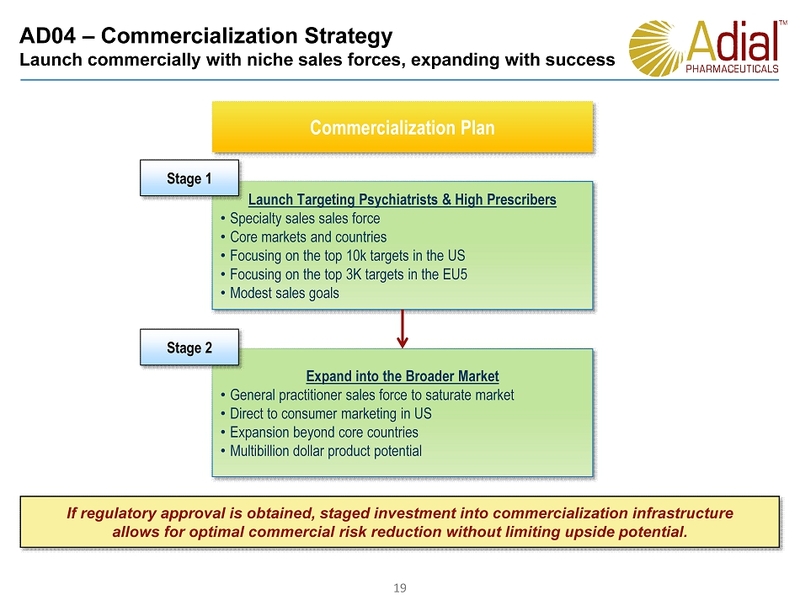 of Psychiatry, Prof. of Neurobiology, Neurology, Medicine, and Pharmacology, and the Director of the Brain Science Research Consortium Unit ▪ Kevin Schuyler, Vice Chairman & Lead Independent Director – Senior Managing Director, Cornerstone Partners, which manages public market investments for endowments, trusts, and foundations; formerly: Chief Investment Officer, The Nature Conservancy; McKinsey & Co.; Louis Dreyfus Corporation ▪ William B. Stilley, CEO ▪ Tony Goodman , – Managing Director/Founder of Keswick Group, a life science strategy firm; formerly: Chief Business Development Officer of Indivior; PRA International; Purdue Pharma. 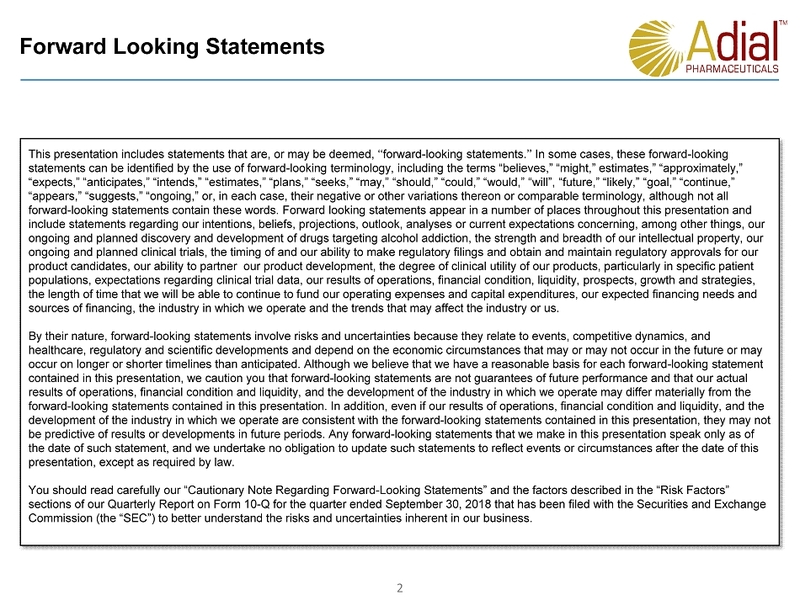 ▪ J. Kermit Anderson – CFO and VP, Cumberland Development Company; formerly with AMVEST ▪ Robin Gilliland – Principal, Keller Enterprises; formerly Director, Brunswick Group (advised on Pfizer - Wyeth, Celgene - Pharmion , and Mylan - Merck KGaA Generic deals) ▪ James W. Newman, Jr. – Life science entrepreneur, investor and board member; Chairman & President, Medical Predictive Sciences Corporation Board of Directors Good blend of leadership, finance, and life science experience. 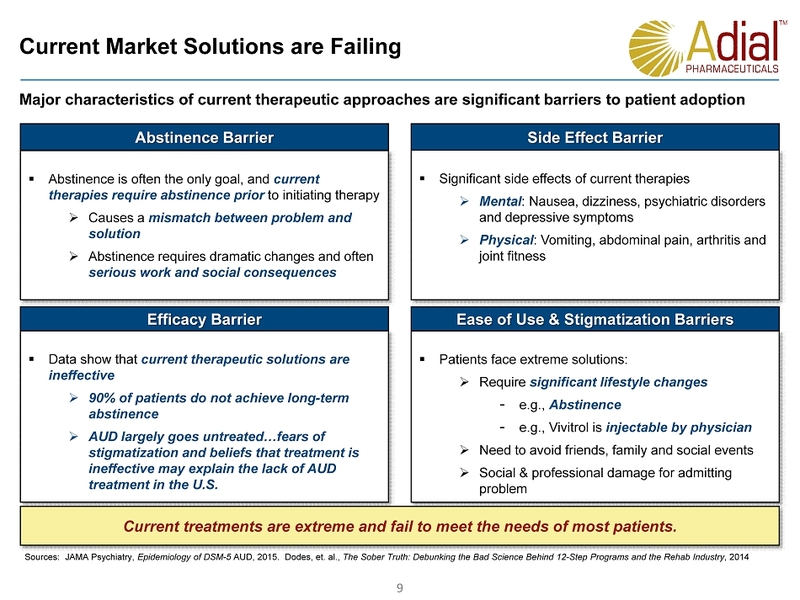 7 Significant Segment of Market Not Being Addressed U.S. Market The vast majority of patients that have AUD remain undiagnosed and untreated, creating a large market opportunity for a product that can address patient needs Patients With AUD 35 Million ~2.7M ~1.3M Patients seen by a health care practitioner for AUD Patients seeking treatment for AUD Patients with AUD Sources: Prevalence of AUD over 12 - monhts as reported by Grant, et. 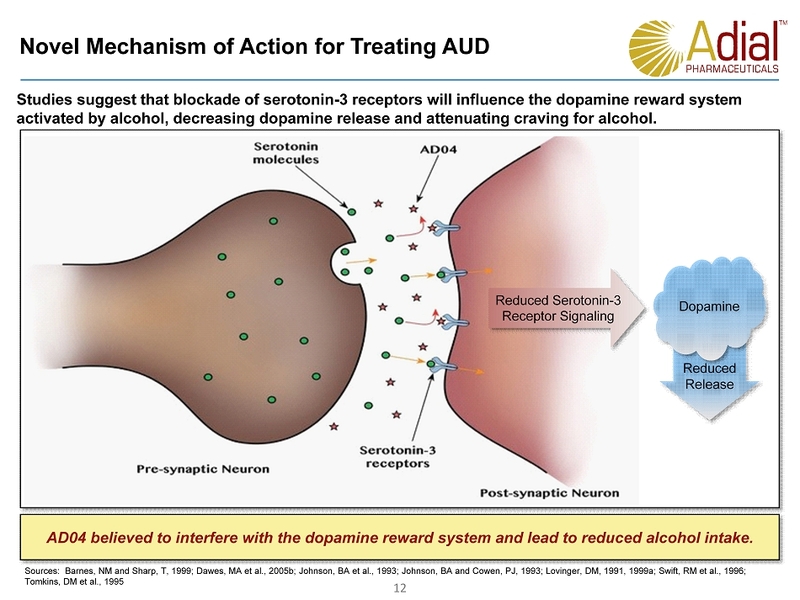 al., JAMA Psychiatry , Epidemiology of DSM - 5 AUD, 2015;72(8):757 - 766. 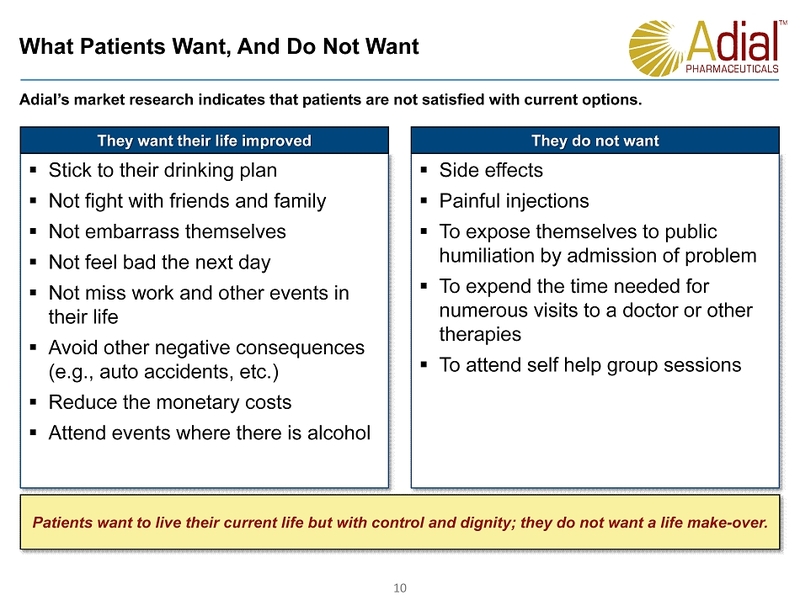 Due to limitations of existing therapies, over 95% of people with AUD do not receive medical treatment. 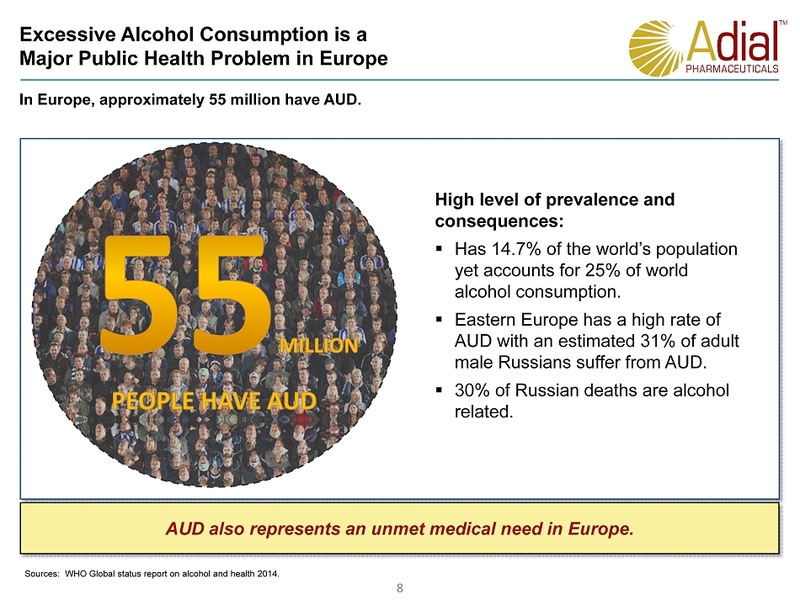 8 Excessive Alcohol Consumption is a Major Public Health Problem in Europe In Europe, approximately 55 million have AUD. High level of prevalence and consequences: ▪ Has 14.7% of the world’s population yet accounts for 25% of world alcohol consumption . ▪ Eastern Europe has a high rate of AUD with an estimated 31% of adult male Russians suffer from AUD. ▪ 30% of Russian deaths are alcohol related. Sources: WHO Global status report on alcohol and health 2014. 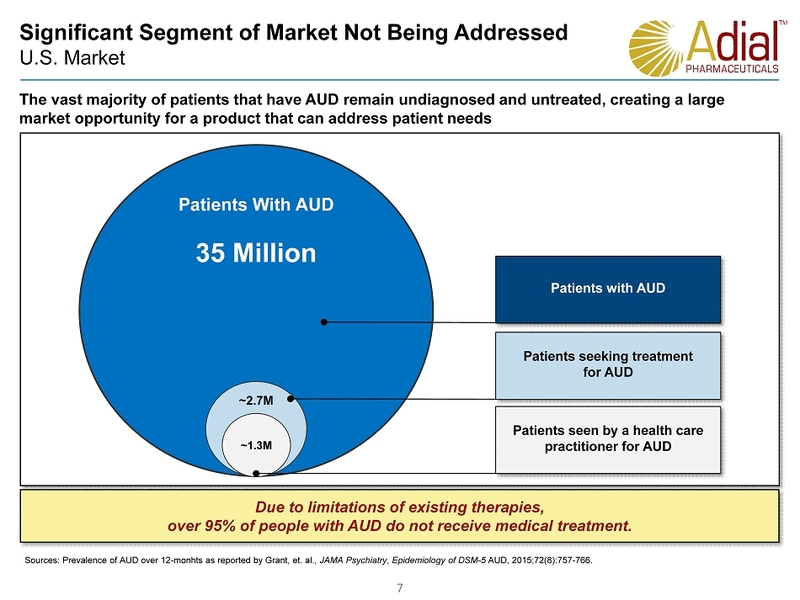 AUD also represents an unmet medical need in Europe. 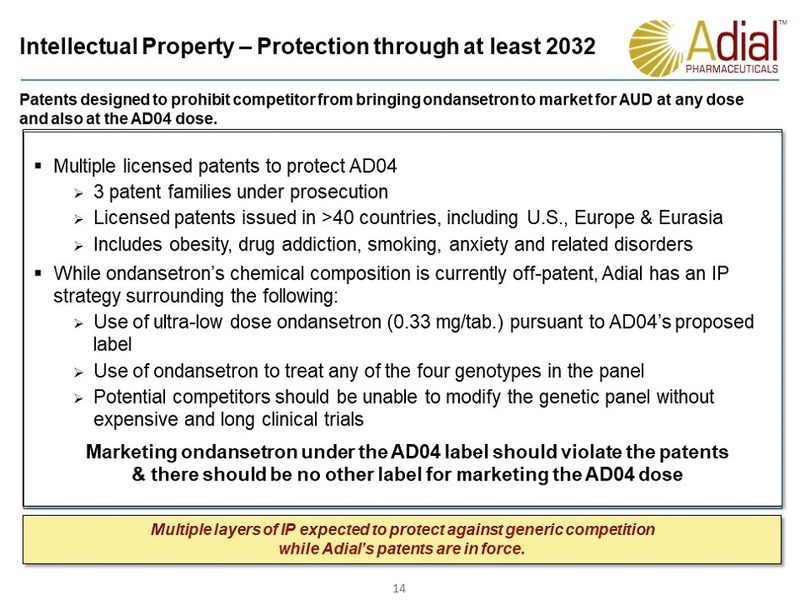 14 Intellectual Property – Protection through at least 2032 Patents designed to prohibit competitor from bringing ondansetron to market for AUD at any dose and also at the AD04 dose. 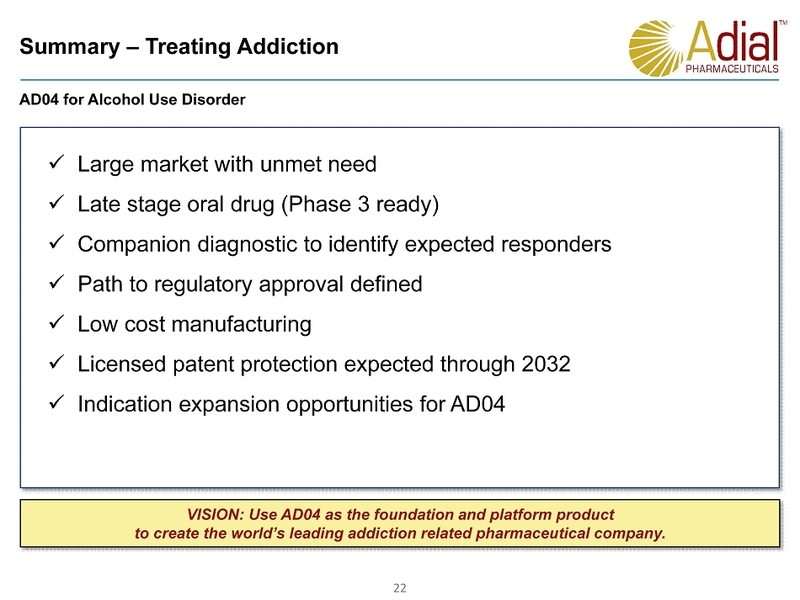 ▪ Multiple licensed patents to protect AD04 » 3 patent families under prosecution » Licensed patents issued in >40 countries, including U.S., Europe & Eurasia » Includes obesity, drug addiction, smoking, anxiety and related disorders ▪ While ondansetron’s chemical composition is currently off - patent, Adial has an IP strategy surrounding the following: » Use of ultra - low dose ondansetron (0.33 mg/tab.) 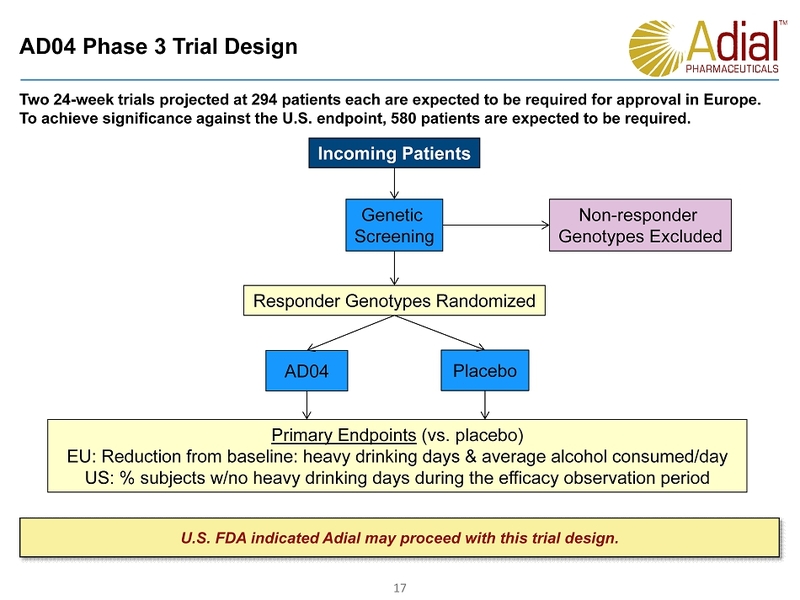 pursuant to AD04’s proposed label » Use of ondansetron to treat any of the four genotypes in the panel » Potential competitors should be unable to modify the genetic panel without expensive and long clinical trials Marketing ondansetron under the AD04 label should violate the patents & there should be no other label for marketing the AD04 dose Multiple layers of IP protection should prohibit generic competition while Adial’s patents are in force. 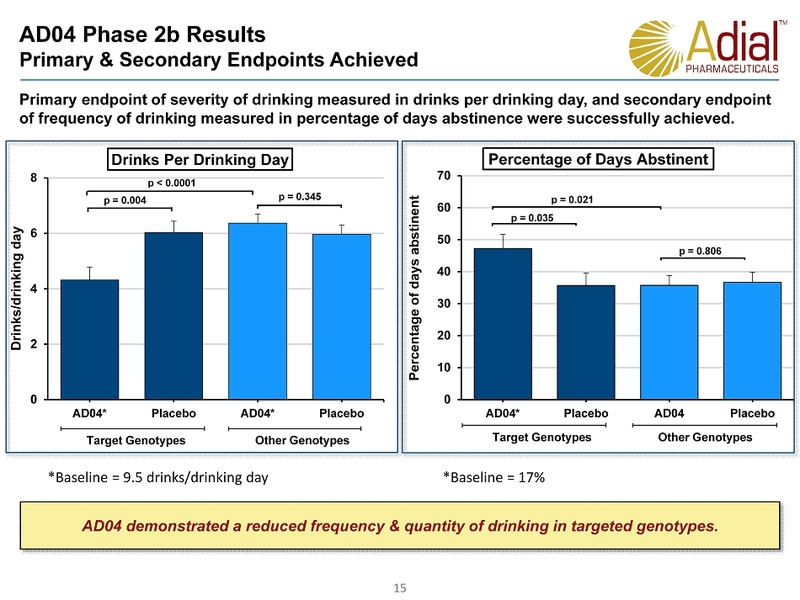 22 Summary – Treating Addiction AD04 for Alcohol Use Disorder x Large market with unmet need x Late stage oral drug (Phase 3 ready) x Companion diagnostic to identify expected responders x Path to regulatory approval defined x Low cost manufacturing x Licensed patent protection expected through 2032 x Indication expansion opportunities for AD04 VISION: Use AD04 as the foundation and platform product to create the world’s leading addiction related pharmaceutical company.